We are pleased to share some of the current results from our 2013 Basic Business Viability Study of Independent Human Development Professionals. 1) They have completed the ChangeWorks® profile online. 2) They have participated in a private debrief of their ChangeGrid®. 3) They have provided feedback about their experience. Since the study reveals a rather vast amount of insight, we think it’s best to present the results in smaller sections as a series of Executive Briefings so as not to overwhelm anyone with the sheer volume of information. When the study is complete we will make the complete results and statistics available. In subsequent briefings, we will present the findings and recommendations for each the 25 mission-critical activities the study explores. As we work our way through the series, we encourage all of you to have your ChangeGrid available for you to refer to as you learn more about yourself, your business and how you compare to your colleagues. If you haven’t yet participated in the study, please CLICK HERE for details. If you have questions at any point, please don’t hesitate to contact us directly at 704-987-6500. This Executive Briefing will focus on the current rankings of the 25 mission-critical activities the study explores. Rankings are based on the average of the ratings participants provided for each of the 4 dimensions the ChangeGrid explores: Size, Ability, Challenge and Importance. In the “Ranking” column, you will find the 25 mission-critical activities listed from the one that scores highest for the highlighted dimension. In the “Activity #” column, you will find the original number assigned to each activity. In the “Activity” column, a brief description of the activities. 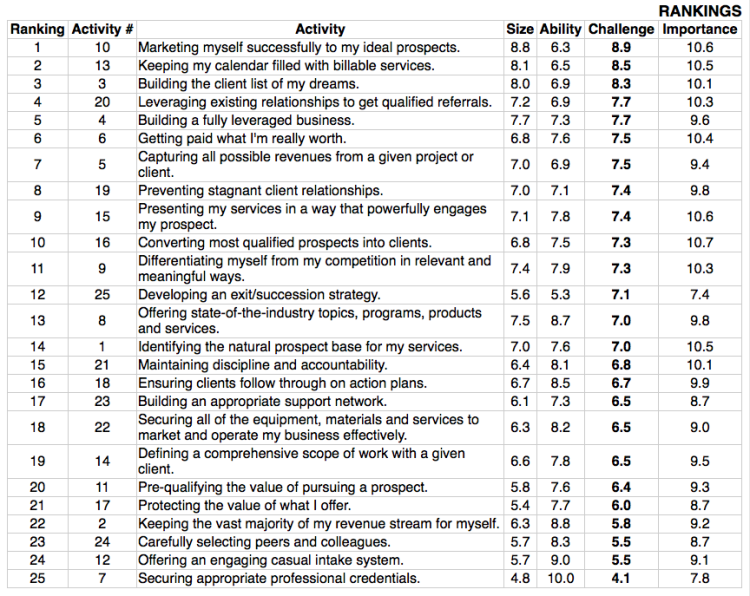 In the “Size” column, you will find the AVERAGE rating provided by ALL respondents for how BIG of a task the activity represents. How much time, energy and other resources the activity will consume. As is the case will all 4 of the dimensions we explore, the scale ranges from a LOW of ZERO to a HIGH of 12. 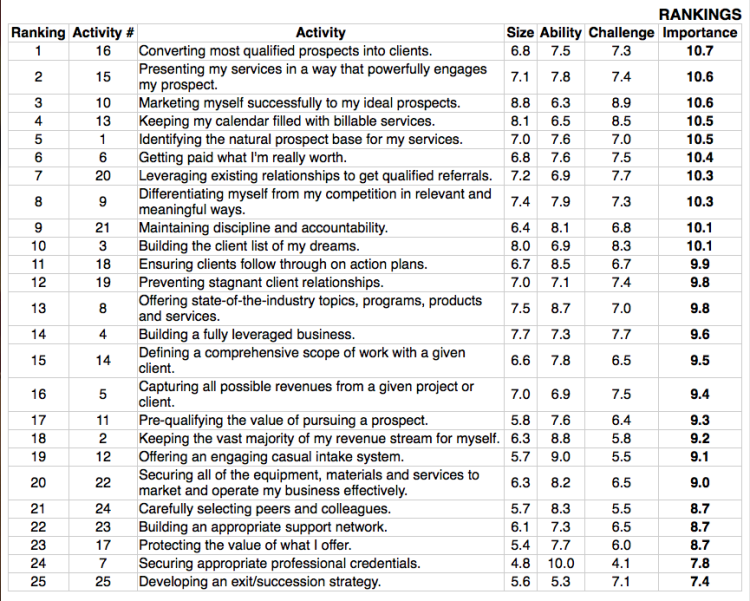 Similarly, in the “Ability,” “Challenge,” and “Importance” columns, you’ll see the average ratings the respondents gave for each of those dimensions. In each chart, ONE of the dimensions will have the averages shown in a BOLD font. Activities are ranked from the highest average rating to the lowest for that dimension. The first table focuses on the average ratings for Importance. The top five activities are all related to business development, with heaviest Importance placed on finding a prospect (marketing), presenting services (sales) and closing the deal (sales). Keep in mind that the numbers shown are averages on a 0-12 scale. An average rating of 10 or higher is HUGE. At the bottom of the list, developing an exit strategy and securing credentials still rate above the midpoint of the scale. Overall, these ratings tell us that the human development professionals consider all of these activities to be moderately-high to very high on the Importance scale. 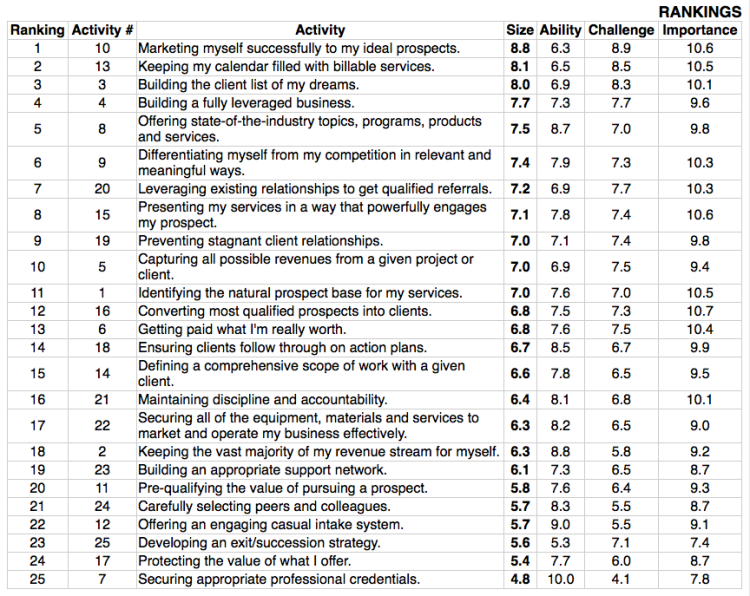 The second table focuses on the level of Challenge the respondents associate with each activity. Here, marketing (10) appears as the most challenging activity, even though an average rating of 8.9 places it the moderately-high range. It’s also interesting to note that keeping a full calendar (13) and building a great client (3) list are the result of other activities, not so much activities in and of themselves. 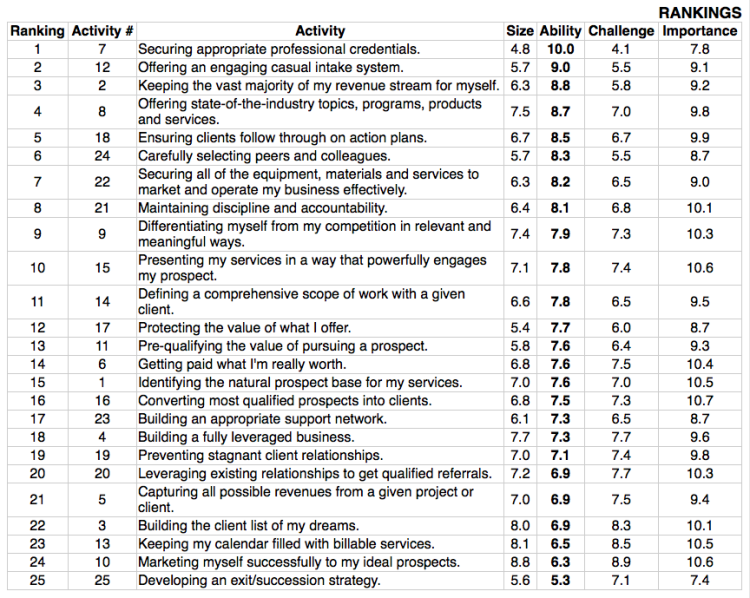 While activities plotting high on the Challenge scale can be problematic, those plotting at the bottom of the list can also be issues worth looking at. Activities that offer little or no Challenge can become routine and boring, moving to the “back burner” of their mind, in this case securing credentials (7) and offering an engaging intake system (12). The danger here is that these activities may be taken for granted and left in an “as is” or “business as usual” state. The third table focuses on Ability. It is very noteworthy that the two activities at the BOTTOM of the Challenge ratings are also the TOP two activities in the Ability ratings. This makes the “back burner” situation described earlier even worse. When Challenge is low and Ability is high, the issue becomes one of untapped potential — and the question to consider is “How can I take these activities to a new level?” But the most concerning activities are those at the bottom of the Ability list — which are also at the TOP of the Challenge list. In essence, the respondents are saying, “It’s very difficult and I don’t know what to do” when it comes to marketing (10), keeping their calendars filled (13) and building a great client list (3). The fourth table looks at the relative SIZE of an activity — how much time, energy and other resources the activity will require. Again, activities 10, 13 and 3 take the top positions. To identify the activities that are most problematic overall, we identify the top 5 ranking activities in each dimension and “flag” them “red.” The next five, “Orange” and the next five are flagged “Yellow.” (In the event of a tie, we include all activities with the same average rating for that dimension, so there may be more than 5 flags of a given color.) Each flag color carries a numerical value — Red = 3 , Orange = 2 , and Yellow = 1. To determine the “Problem Score,” the flags for a given activity are converted to their numerical values and added together. The highest possible Problem Score is 12. In summary, strong patterns have emerged — and they are telling a very clear story. The average human development professional has the credentials, the equipment, the intake system, the colleagues and the autonomy to support them in building a career that truly matters. But they are struggling to get the clients they want most — and need to keep their calendars filled and build the client list of their dreams. It’s important to remember that averages are just that … averages. While they give us valuable insight into the population as a whole, they tell us very little about the individuals themselves. In the next Executive Briefing, we will take a look at the individual profiles of some of the respondents in the study (anonymously of course) and show how they compare to the population. In preparation, those of you who participated in the study are encouraged to pull out your ChangeGrid and see how you compare. The Basic Business Viability Study of Human Development Professionals is an active research project and we encourage all of you to spread the word to your colleagues and encourage them to participate. For full details, please VISIT the BBVS homepage.